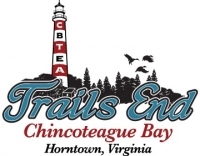 CBTEA is a private, waterfront campground resort. Lot owners may build permanent camping additions, room enclosure and even cottages. The Association is governed by Articles of Incorporation, By-Laws, and Covenants and managed by five directors. Trails End is convenient to a wealth of natural resources, historical, and recreational resources. Home to over 275 different species of birds and the unique wild Chincoteague ponies, Chincoteague Wildlife Refuge includes 37 miles of protected beaches and dunes. Minutes from Assateague State Park and the historic Assateague Lighthouse. Waterfowl Museum, the Oyster Museum and the Chincoteague Pony Centre, which has a number of ponies and offers riding lessons are all located minutes from Trails End. Boat tours are widely available around the Islands. The historic Worchester County towns of Snow Hill founded in 1642, Furnace Town, a re-creation of the 1840’s village, Berlin, featuring a newly restored turn of the century main street and Pocomoke City featuring historic homes and a genuine 1920’s art deco movie house. Trails End is a few hours drive from major East Coast Cities from Norfolk to New York.